In some circles, Portal are hailed as Australia’s number one death metal band, owing to their extravagantly horrific live performances. 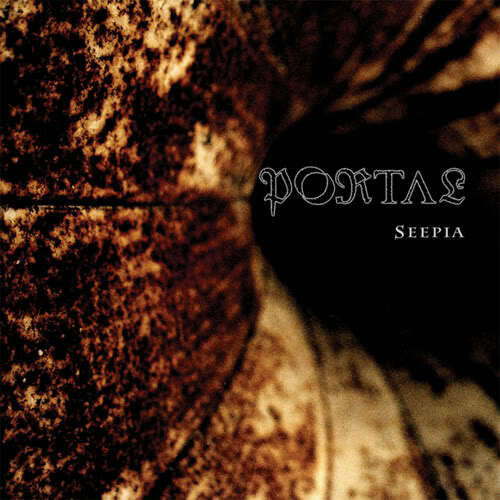 Seepia was their first full length, being released in 2003. Since then, the band has gone on to release two more albums and continue to grow in notoriety. Let me just say, I really do love bands that build a mystique about themselves, so I am not adverse to the pseudonyms and costumes adopted by the band. However, no matter how horrifying a man with a clock for a head may appear on stage, this doesn’t do much when popping in a CD. That is why, when having heard this band’s music described as “Antique Horror”, or in any other way associated with a sense of fear and general creepiness, I return to this record. Honestly, Seepia offers nothing in the way of fear-building. Perhaps to those unfamiliar with death metal, or for those who have experienced the band live. But for me? The only thing that alludes to any sort of atmosphere-building is the intro track, which comes across as a jarring, distracting piece, detached from the following death metal onslaught – perfectly skippable without any loss on the overall experience. No fear, no terror, just annoyance at yet another band slapping on an un-necessary intro. These passages return throughout the album, with a semi-interesting chiming bell appearing a little before the half-way mark, but again it doesn’t do much and really just breaks up the flow of the album. Whilst the last few moments may articulate exactly what the band was trying to do throughout with their samples, it is just too little, too late. Despite this, the album, when treated simply as a death metal release, really isn’t bad. Portal formed a decade before Seepia was released. They have obviously used this time well, as not a single riff feels out of place. The production is muddy, with vocalist “The Curator” commanding “Altar Of Madness”-esque rasps and screams, buried sufficiently in the mix to create a cacophony of noise. The album sounds like it was recorded in a crypt, and this is definitely the perfect production for such an album. The guitars are what really stand out on this record. Far from refined, technical wankery, they seem to relish in their dissonant, unpredictable nature, crawling through the album at an alarming pace. A balance has been hit here between distinctive and memorable riffs and use of the guitar as a tool for creating a thick, suffocating texture. This is an old school death metal release with a few new flairs. Such a deliberately destructive production was perhaps not possible when Portal first hit the scene, and definitely not when their predecessors did. As such, the album is unmistakeably separate from others in the same vein. If it wasn’t for the ineffective attempts at creating a horrifying atmosphere, this could have been an absolutely outstanding slab of raw, evil, music. There might not be anything too mind-bending about this release, but it sure is a fun one. Those looking for some solid death metal riffs look no further, but those wishing for a disturbing, spine-tingling experience should perhaps look to the band’s other releases, or simply their live show. This entry was posted on July 26, 2011 at 3:43 pm and is filed under Records. You can follow any responses to this entry through the RSS 2.0 feed. You can leave a response, or trackback from your own site.